Making meals that have a low GI (Glycemic Index) can be challenging because after a while, you start running out of creative ways to match proteins and sides. This is where planning your meals ahead really helps. 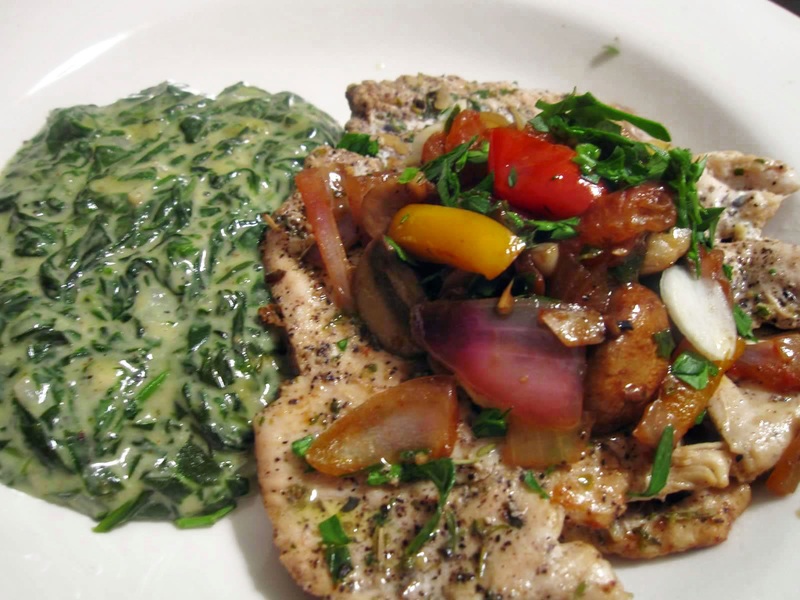 One of the meals I made recently which ended being a nice surprise was the grilled chicken paillard dish I made. I served it with creamed spinach, but to help make it more figure friendly, I used ricotta as one of the main ingredients, as opposed to heavy cream thickened by a roux. The mixed pepper relish really added a nice flavor component. The best part was that it was super easy to make. Wash and pat the chicken breasts dry. Butterfly each chicken breast and place a piece of plastic wrap on top of it. Using a meat mallet, begin pounding the chicken lightly until it is nice and thin. About 1/8". Sprinkle the herbs de Provence, salt and pepper on each piece. Using a non stick pan, add a little olive oil and allow for the pan to get hot. Place the chicken in the pan and allow it to cook through. This should not take very long because the chicken is very thin. I'd say about 3 or minutes on each side should do the trick. Squeeze a little lemon juice on each piece of chicken while cooking. Transfer to a plate. Coarsely dice the bell peppers and onion. Slice the garlic into thin pieces, using the same pan as a chicken, add a little olive oil. Transfer the peppers, onions and garlic to the pan. Saute until the veggies are tender but still retain a little bite. Add the mushrooms and continue to cook. Once the mushrooms have cooked till they're tender, add the balsamic vinegar, salt and pepper to de-glaze the pan. Add this to the top of each piece of chicken and garnish with parsley. Add butter to a nonstick pan and allow it to melt thoroughly. Next add the half and half, milk, and ricotta cheese and combine well. I used a whisk to do this. Ricotta tends to have a bumpy texture so you want to make sure to incorporate it well. Once, that's done, add the grated Parmesan, nutmeg, cayenne pepper, salt and black pepper and whisk again. Grate the garlic and also add to the pot. Let the mixture cook a bit to evaporate some of the liquid. While that is cooking, combine the arrowroot powder with water and set aside. This would also be a good time to chop the spinach. Add the spinach in and allow it to wilt down. The spinach will release a lot of water which is why you want to add the arrowroot as a thickener at the end. Allow everything to cook, until you have the consistency or thickness you want. If it needs to be thicker, dilute a little more arrowroot in some water and add. You have to let the spinach cook on a high enough heat to kick start the thickening power. Serve with the chicken and enjoy an awesome meal.